Reports emerged on Wednesday that another Ahwazi Arab prisoner in Iran has died under torture in a regime prison, with horrific video footage showing marks left by torture all over his body after it was returned to his family. Adding insult to injury, prison personnel warned the dead man’s family that they should not treat their loved one as a martyr since he had been a troublemaker, inciting riots amongst other prisoners, an allegation his family treated with the proper contempt. 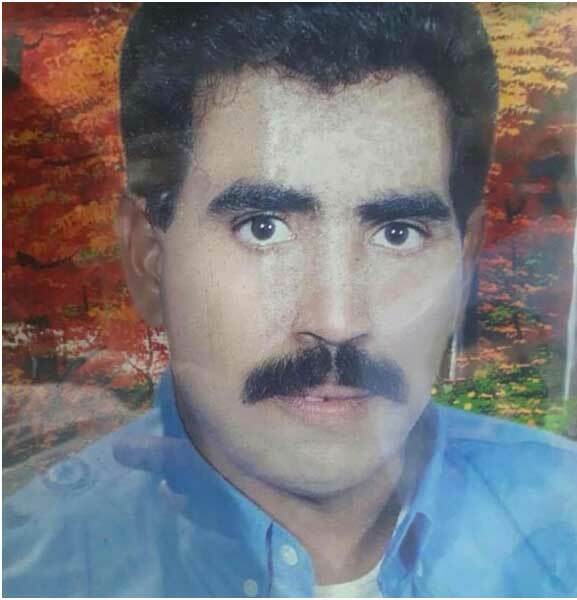 The body of 50-year-old Ali Sawari was returned to his family in the Sepidar neighbourhood of Ahwaz city on Monday, March 26 by officers from Sheyban Prison near the regional capital. The distressing video footage shot by his family members, who risked their own lives to show the world the horrific torture inflicted on their beloved son, sibling, husband, and father, shows his body covered in scars and bruises from torture. According to family members, it seems probable that Sawari, a married father of four children, was tortured to death by an infamously sadistic guard known as ‘Hamidian’ in retaliation for complaining about the atrocious conditions at the notorious prison. Following his death at the hands of ‘Hamidian’, prison staff rushed his body to the morgue and called his family members to come and fetch it. The prison officer, Hamidian, who’s infamous across the region for his vicious sadistic cruelty, and the depraved pleasure he takes in the brutal torture of Ahwazi political prisoners, previously worked at the notorious Karoon Prison which recently closed down before being transferred to Sheyban Prison. Sawari, an Ahwazi Arab prisoner, had been in prison for four years on trumped-up charges; this persecution is common for Ahwazi Arabs and members of other ethnic and religious minorities in Iran, with the regime using the threat of torture and imprisonment as a means to terrorize dissidents and activists into silence. A family member of Sawari said that during a recent family visit with him, the last time they saw him alive, he told his family members that he was set to gather other prisoners to submit a formal complaint to prison officials about the pitifully small portions of food given to inmates and the putrid quality which he said was unfit for animals, as well as about the lice-infested overcrowded cells which contributed to outbreaks of disease. His relatives recalled that he told them he dreamt of eating fruit and vegetables after receiving only nauseating and minuscule rations of food unfit for animal feed, adding that the prison staff distributing the food would subject prisoners to racist verbal and physical abuse whilst doing so, spitting in the inmates’ faces and food and taunting them by calling them “Arab animals”; this sort of racism is the norm by regime officials towards Ahwazis and other ethnic minorities in Iran, where the regime encourages a culture of Persian supremacism. Sawari’s relatives also said that he had told them about organizing several protests by inmates against the unsanitary conditions and the prison’s failure to use insecticide to kill the lice and other insects that infest the cells and spread disease. His family members recalled telling him during that last visit that they had brought fruit, food, toiletries, and clothes to the prison for him, which they handed over to prison staff who promised to pass them on to him; he told them that he had received nothing with the prison guards clearly stealing the items delivered for him. Sawari’s family members struggled to contain their own anger and distress not only at the unspeakable suffering inflicted on him by the prison staff but on the way in which he had been slandered even after being tortured to death, with the warders threatening that the bereaved family would suffer further if they requested an additional autopsy and ordering them to bury him fast and not make a heroic martyr of him since he was a troublemaking inmate who, the prison staff said, had constantly incited fellow inmates to riot and protest. Tragically, such shocking deaths are not rare for Ahwazis, with many prisoners being tortured to death in regime prisons in recent years; although Ahwazi human rights groups have reached out to international humanitarian bodies and organizations such as Amnesty International and Human Rights Watch, these groups refuse to investigate the regime’s crimes. This problem is exacerbated by the refusal of many Iranian human rights groups to give any consideration to the routine racist persecution and murder of ethnic minorities. Media too are reluctant to mention the systematic human rights abuses of Ahwazi people.